Set of 5 for your Jeep. All four tires and the spare! 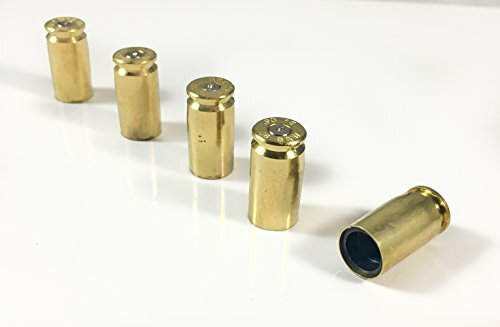 Show off your love of guns with these brass bullet tire caps, handmade from recycled .40 caliber bullet casings. These rounds have been loaded, chambered, fired, and ejected from a .40 caliber Glock 23 during law enforcement training operations. The tire caps are designed with an actual brass bullet casing and a sturdy screw cap inlay. The brass holds up well in all conditions and protects your valve stems from dirt, rocks, and whatever other abuse you put your vehicle through. These caps are tough, rugged, and designed to show off your tactical side. Whether you're a military serviceman, law enforcement officer, survivalist, doomsday prepper, zombie hunter, or gun buff, these are the tire caps that your vehicle deserves! -Perfect for motorcycles, cars, bicycles, and ATVs. The ultimate tactical automotive accessory. A great stocking stuffer for the holidays! -Please Note: these bullet casings have been fired from a firearm, and as such, the casings may have small dings and aesthetic imperfections. Ammo brand stamps may vary. Hollow-Point Gear donates 5% of all sales to Operation Homefront, a national 501(c)(3) nonprofit whose mission is to build strong, stable, and secure military families so they can thrive - not simply struggle to get by - in the communities they have worked so hard to protect. For more information visit: www.operationhomefront.org. Bullet casings provide maximum ballistic durability. Add a tactical touch to your motorcycle, car, or bicycle. Fits all standard size tire valve stems! If you have any questions about this product by Hollow-Point Gear, contact us by completing and submitting the form below. If you are looking for a specif part number, please include it with your message.